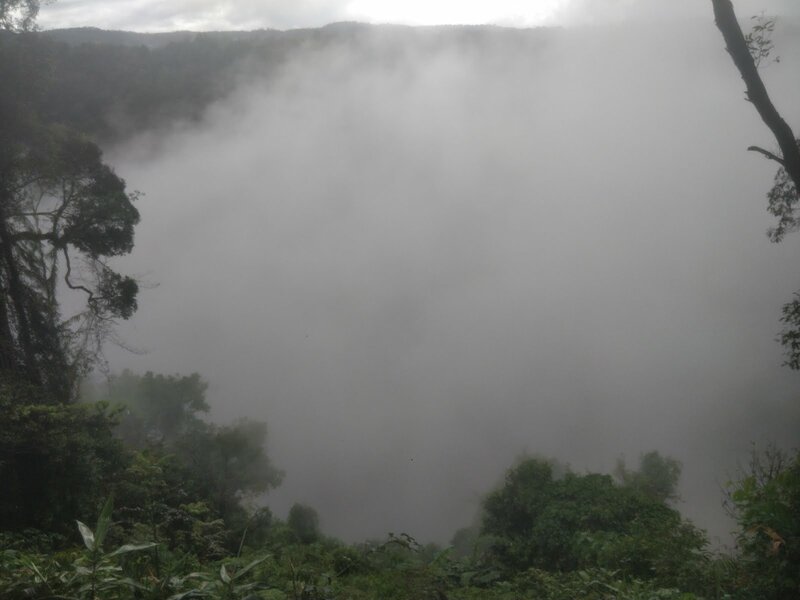 The journey to Pakse from Don Det was easy compared to how hard it had been to get there. We got a boat back to Nakasong and then got straight in a nice minivan all the way to Pakse, I even managed to get the front seat as it was available. Our hotel in Pakse was the Xuanmai Garden resort, which was a fair bit away from town, so we got dropped off at the side of the dual carriageway and wandered down a dirt track into the lush green garden surrounding the guesthouse. It looked like we were the only guests staying here again and we were shown to a comfortable but basic double room with en-suite which apparently had a garden view, but as it had no glass in the windows we kept the shutters closed to keep the room cool and insect free. We were staying here a couple of nights then the plan was to hire scooters and head onto the Bolaven loop for a night. This takes you past loads of waterfalls, villages and coffee plantations and as Ngoc, the guesthouse owner, was able to look after our big packs we could travel with just an overnight bag each. Ngoc arranged the bike hire at a slightly inflated daily rate of 100,000 kip per day, due to our distance from town, the bikes were good though and they supplied padlocks for locking them up. Setting off on a bike again was nice as we hadn’t had any in Vietnam or Cambodia and it was lovely to be back zooming around completely in control of when and where you stopped. We’d decided to do the short loop in a clockwise direction as blogs etc said the roads could be bad in wet season on the larger loop. 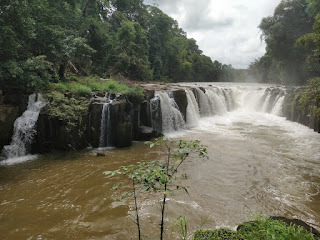 First stop was Pha Suam Waterfall. This is a small but pretty U-shaped fall which will shortly be ruined by a resort being built next to it. For the moment though you pay your entrance fee & parking fee and cross an old wooden bridge to a café with wooden platforms overlooking the falls. We took our bikes with us across the bridge as there didn’t seem to be anyone in charge of parking here, but I suspect in high season and when the resort is finished you would leave them on the other side. Bike thefts on the Bolaven loop is a much gossiped about topic, it’s worth paying the extra few thousand kip to ensure it’s there when you return to it, especially in high season. 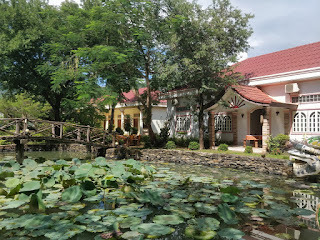 Next stop was Mr Vieng Coffee and homestay. We’d read that this place was a little gem and the coffee, when we tasted it, didn’t disappoint. As expected we were the only visitors but Mr Vieng still sat down and chatted to us about coffee and his life there until the thunder started rolling around the mountains and with 25km to go until we hit the next town we thought we’d best get going. The roads around the loop are wide and smooth surfaced and due to it being low season mostly empty, occasionally you will get a few other bikes, tractors or haulage trucks joining you. Turning off the main road we came to a little village called Tad Lo. It’s a known stop on the backpacker route with a couple of waterfalls and guesthouses, most of the accommodation isn’t online so we had headed here without a confirmed bed for the night but confident that there would be room somewhere. 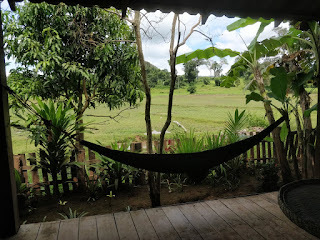 We were aiming for Palamei Guesthouse which comes highly recommended on TA and blogs and is run by a guy called Poh (?) and his family. 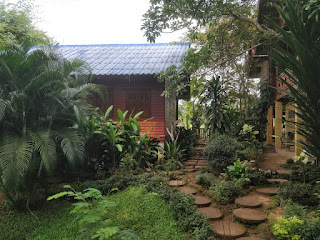 The young lad that greeted us spoke good English and quickly led us down a stepping stone path, through a beautiful jungle garden to a bungalow on stilts overlooking rice paddies. It was gorgeous triple room with fans and an en-suite bathroom for only 70,000 kip a night, that’s about £6! We settled in and then went back to sort out money and bike storage. They had a French lady living with them for the next few months that was teaching his kids English and she helped us store the bikes in a locked garage and provided detailed maps of the local area, so we could set off to find more waterfalls. The first one was Tad Lo waterfall which is accessed through the Tadlo resort. I suspect you are meant to pay but the group of youths by the gate just let us wander in without any charge. We’d heard and seen lots of signs saying that this resort does elephants rides to bulk their tourism income and I had really hoped that I wouldn’t have to see them but sadly we had to walk right past them. Two beautiful elephants stood chained near the resort entrance and although there was no physical damage on them one of them was clearly rocking from side to side standing in the full sun which was very upsetting. The Tad Lo waterfall is a few mins walk up river from the lodge, you follow a narrow dirt path which looks more like a dried stream bed, through a hole in the fence and along the upper edge of the river, finally you get to some very old looking bamboo and wood steps which go down to the foot of the large waterfall. It’s very wet from spray down at the bottom and the steps don’t feel the safest but once down there the view is great. Back onto the main road and 5 mins walk the other direction is Tad Hang waterfall. This is again accessed through a resort but this one charged us 5000 kip each to go out on their wooden platforms. I was glad that we had decided to do this during wet season as these wouldn’t have had anywhere near as much water going over them in the dry months and so far we’d not been caught out in torrential rain. We headed back to our guesthouse where Poh informed us that they would be having a family style dinner if we wanted to join them. 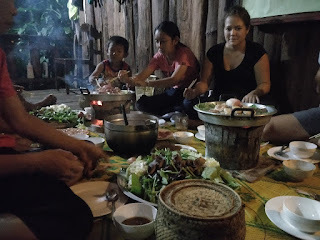 This meant we’d prepare, cook and eat the food with the family and other guest for only 35000 kip each (just over £3). It sounded perfect and with an hour or so before they wanted help with dinner we sat in the front restaurant with a beer and a book. 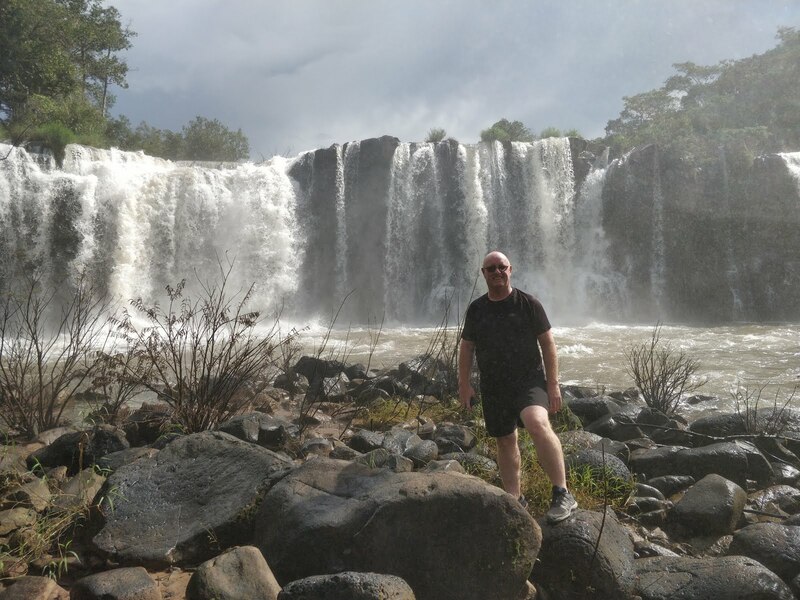 Shortly after we’d sat down the other guest staying there arrived and we saw it was none other than Bronwyn who had travelled over the Cambodia – Laos border with us a few days prior. She had been here a day already and had got herself involved with teaching English with Mattie (?) the French lady that was working at the guesthouse. We had a nice catch up before she went off to teach the teenagers in another room whilst the 2 younger children stayed playing on an English app Mattie had. It was so cute hearing the 6-year-old boy trying to say the names of fruit and veg in response to his game – to his credit he nailed complicated words like Avocado with only a couple of attempts. Dinner to our delight was going to be a BBQ / hotpot thing that we’d seen in restaurants through Cambodia but hadn’t had a chance to try. The pan is shaped a bit like a metal sombrero with a raised bit in the middle that you cook the meat on and a deep well around the edge that you add stock to and boil loads of veg in. Two of these over small charcoal stoves were placed on the floor and we then sat around them cooking bits of food, chatting and having one of the best meals we’d had on this whole trip. After we’d all stuffed ourselves silly; Big, the little 6-year-old, makes everyone 1 pancake each, which is eaten off 1 communal plate to save washing up, before he allowed himself to have the last one. Poh is an amazing guy that works really hard, I learnt that 2 of the teenagers that live there were abandoned by their real families as here they could offer them education, work and stability and every day Poh drives all the kids in the village to school and picks them up again. The only downside to our stay was the lack of sleep, which wasn’t their fault, but the dogs were clearly telling something off around our cabin and they barked for half the night. The next morning feeling a little groggy but still so full from the previous nights dinner we set off to further explore the loop. We had meant to stop at Captain Hooks coffee and village tours but as we’d slept in a little later than planned and we’d heard that the owner loves the sounds of his own voice we decided to skip it. Bronwyn, who had been the previous day, told us a few of the stranger stories he’d told her with child brides being common place, mothers by the time they are 15 and introducing children to pipe smoke as young as 3! The scenery around the loop isn’t as spectacular as we’d hoped it would be, we still saw some fabulous mountains with tops hidden by cloud off in the distance but nothing that would transpose to camera and most views were obscured by large trees lining the road. 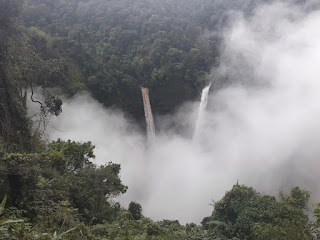 By the time we’d got to Paksong and the next group of waterfalls the sky was beginning to cloud over and a light drizzle had set in. The next waterfall was Tad Yuang, which is an impressive 40m high cascade with steps going all the way down from the top to the bottom. Here it didn’t matter that it was drizzling as the spray gets you soaked the nearer you venture. It was quite exhilarating as well as being a feast for the eyes. By the time we got back on the bikes the rain is becoming heavier and even with rain coats on over our backpacks we’re worried about our belongings getting soaked, we made it to the carpark of the next waterfall and there we holed up in the corner of a stall waiting for the rain to lessen. Tad Fane is probably one of the best-known waterfalls on the circuit as its twin streams fall over 120m down into a gorge and the viewing area is nicely positioned straight in front of it. 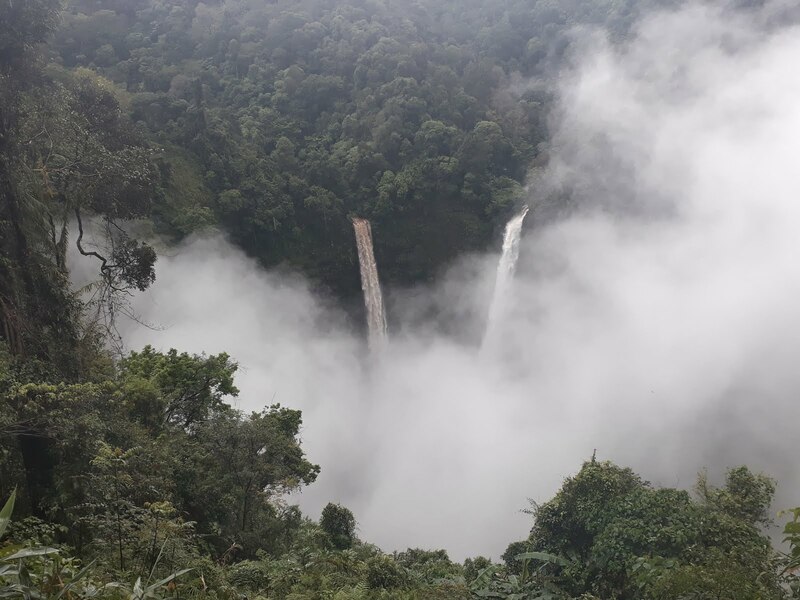 Because there is so much water going over the resulting spray and mist sadly obscures the perfect picture, but the noise and fleeting glimpses of the falls is stunning. 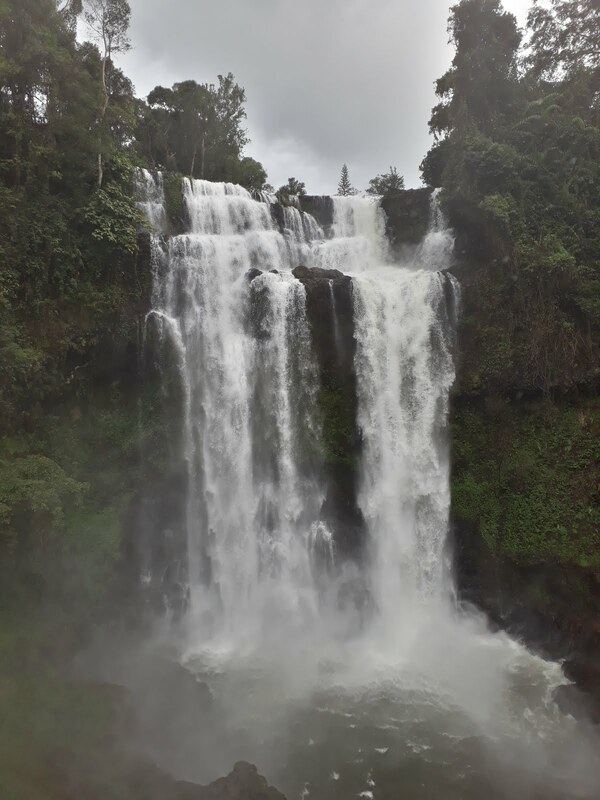 With fairly numb bums but with the sun now drying all our clothes we made one more pit stop at Tad E-Tu falls, which compared to the others we’d seen wasn’t that impressive but that might be because the resort hasn’t made much of an effort with viewing areas. 30mins later we had closed the loop and were back in at the Xuanmai garden resort feeling dirty and tired. We had 1 more night here and then a flight to Vientiane late the following day so plenty of time to shower, repack and sleep.